Customers are an integral part of any business, be it small sized or a huge one. CRM software is used to manage customers and customers related assets. It manages both pre sales and post sales force interactions. It manages contact centre, service support, campaigns, AMCs, assets, work shop, customers’ loyalty, IT infrastructure and information assets. CRM also manages sales force automation which includes setting targets for marketing executives, customer enquiries, quotations and the history in context to it, pre sales and post sales force proceedings and targets achieved, open-lost quotations, expenditure and sales done, schedules and a properly managed list of clients. CRM software takes your customer management to heights where you can assure yourself with a progressing number of customers and clients. CRM provides all facilities to the business owners to retain your clients and customers for the development of the business. CRM software organizes customer related data efficiently and maintains a good name of yours among the customers. Bsquare is a renowned CRM software company in India which has just come up with CRM INTACT. CRM INTACT is a CRM software India which has been developed by one of the CRM software companies in India, Bsquare. 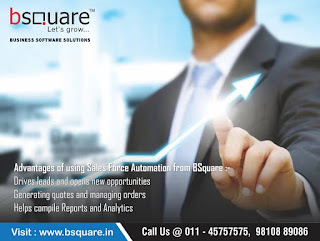 Bsquare with its hardworking software engineers and software developers has provided CRM software which is going to improve your customer relationships. It provides you every facility to management customers and therefore ensures a good customer loyalty. Bsquare has an experience of more than a decade in providing its clients and customers the topmost software solutions.